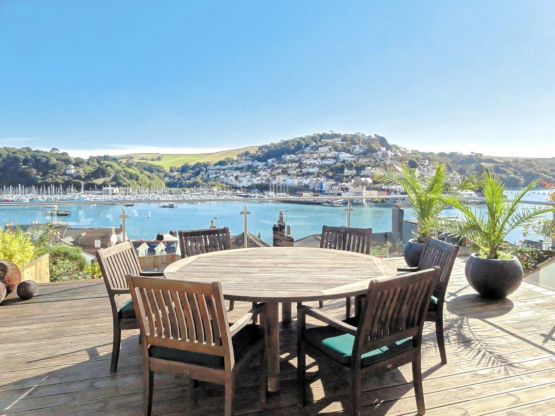 A stunning location, uninterrupted river and sea views and beautiful contemporary interiors combine to make 49 Above Town a very desirable property to purchase and Dartmouth’s eclectic mix of shops, restaurants and galleries are all within walking distance. This immaculately presented townhouse has accommodation arranged over three floors. The magnificent views can be enjoyed from all three double bedrooms, from the living room situated on the middle floor and from the wonderfully light and spacious kitchen/dining room which occupies the entire ground floor. From the dining area French doors open out onto a full-length decked terrace, providing an additional space for entertaining and enjoying the outstanding views. Steps descend from the terrace to further seating areas and an attractive pebble garden with mature plant borders and decking to one corner and benefiting from river and sea views.